O God who the Bishop Saint Paulinus of Nola outstanding for love of poverty and for pastoral care, graciously grant that, as we celebrate his merits, we may imitate the example of his charity. Through our Lord Jesus Christ, your Son, who lives and reigns with you in the unity of the Holy Spirit, one God, for ever and ever. O God, who in martyrdom have brought true faith to its highest expression, graciously grant that, strengthened through the intercession of Saints John Fisher and Thomas More, we may confirm by the witness of our life the faith we profess with our lips. Through our Lord Jesus Christ, your Son, who lives and reigns with you in the unity of the Holy Spirit, one God, for ever and ever. We Are God's First | Archbishop Samuel J. Aquila D.D. 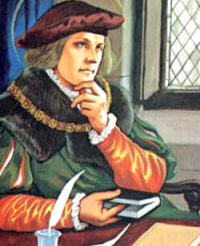 St. Thomas More was born in London, England and was Chancellor of King Henry VIII. As a family man and a public servant, his life was a rare synthesis of human sensitivity and Christian wisdom. St. John Fisher studied Theology in Cambridge (England) and became Bishop of Rochester. His friend, Thomas More, wrote of him, 'I reckon in this realm no one man, in wisdom, learning and long approved virtue together, meet to be matched and compared with him.' He and his friend St. Thomas More gave up their lives in testimony to the unity of the Church and to the indissolubility of Marriage. St. Paulinus was born of a patrician Roman family at Bordeaux. He was successively prefect, senator and consul. His wife, wishing to consecrate herself to God, gave up rank and riches; he followed her example and went to live an austere hermit's life at Nola in Italy. There he became a priest and then bishop of the city, and gave his people not only an example of virtue but also wise guidance during the ravages and calamities of the Gothic invasion. He died in 431, aged 78, and was buried at Nola near the tomb of St. Felix. According to the 1962 Missal of St. John XXIII the Extraordinary Form of the Roman Rite, today is the feast of St. Alban who was venerated as the proto-martyr of Britain. He was a citizen of Verulam and was converted by a persecuted priest whom he sheltered in his house. He was executed on Holmhurst Hill. On that spot King Offa erected the Benedictine abbey of St. Alban's by which name Verulam has since been known. Beheaded on Tower Hill, London, July 6, 1535, he steadfastly refused to approve Henry VIII's divorce and remarriage and establishment of the Church of England. Described as "a man for all seasons," More was a literary scholar, eminent lawyer, gentleman, father of four children and chancellor of England. An intensely spiritual man, he would not support the king's divorce from Catherine of Aragon in order to marry Anne Boleyn. Nor would he acknowledge Henry as supreme head of the church in England, breaking with Rome and denying the pope as head. Four hundred years later, in 1935, Thomas More was canonized a saint of God. Few saints are more relevant to our time. In fact, in 2000, Pope John Paul II named him patron of political leaders. The supreme diplomat and counselor, Thomas More did not compromise his own moral values in order to please the king, knowing that true allegiance to authority is not blind acceptance of everything that authority wants. Henry himself realized this and tried desperately to win his chancellor to his side because he knew More was a man whose approval counted, a man whose personal integrity no one questioned. But when Thomas resigned as chancellor, unable to approve the two matters that meant most to Henry, the king felt he had to get rid of Thomas. Patron: Declared in 2000 by St. John Paul II patron of statesmen and politicians; Adopted children; diocese of Arlington, Virginia; civil servants; court clerks; difficult marriages; large families; lawyers; diocese of Pensacola-Tallahassee Florida; politicos; step-parents; widowers. A Man for All Seasons by Robert Bolt is a wonderful play that captures much of St. Thomas More's vitality. There is a 1966 movie by the same title that stars Paul Scofield as St. Thomas. If you haven't watched the movie or read the play yet, put it on your priority list. Read more on the life of St. Thomas More. For youth, Saint Thomas More of London by Elizabeth Ince, a reprint of the wonderful Vision Books series. For adults, the newer book The King's Good Servant but God's First : The Life and Writings of Saint Thomas More by James Monti which explores the life and writings of St. Thomas More. Also Scepter Publishers has a biography Thomas More: A Portrait of Courage by Gerard B. Wegemer. For some writings by St. Thomas More, see The Sadness of Christ (Yale University Press Translation) and Four Last Things: The Supplication of Souls: A Dialogue on Conscience. If you or your children are considering a career as a lawyer you might find Dr. Charles Rice's article helpful. In 1521 he was asked to study the problem of Henry VIII's marriage. He incurred Henry's anger by defending the validity of the king's marriage with Catherine and later by rejecting Henry's claim to be the supreme head of the Church of England. In an attempt to be rid of him, Henry first had him accused of not reporting all the "revelations" of the nun of Kent, Elizabeth Barton. John was summoned, in feeble health, to take the oath to the new Act of Succession. He and Thomas More refused because the Act presumed the legality of Henry's divorce and his claim to be head of the English church. They were sent to the Tower of London, where Fisher remained fourteen months without trial. They were finally sentenced to life imprisonment and loss of goods. Patron: Those persecuted for the Faith. Read more about St. John Fisher. Exposition of the Seven Penitential Psalms is available from Amazon. In 353 Pontius Meropius Anicius Paulinus was born of a prominent Bordeaux family. He received his education in the school of the rhetorician Ausonius. At an early age he attained the dignity of senator and then of consul. As governor of Campania, he chose Nola as his seat. Here he was converted to the faith by St. Felix of Nola. He resigned his position and returned to Gaul, where St. Martin of Tours restored his eyesight. Despite personal remonstrances, Paulinus was ordained a priest in Spain, and from there he returned to do honor at the grave of his sainted spiritual father. In 409 he became bishop of Tours. Paulinus was an author and poet; he corresponded with the great saints and scholars of his time, Ambrose and Augustine. During the Vandal invasion he used every possible means to feed the poor. When a poor widow asked for money to ransom her son, he gave himself into slavery. With God's aid he returned to his flock and died at the age of seventy-eight in 431. His last words were: "I will prepare a lamp for My anointed" (Ps. 131). His particular virtue was love toward the poor.